You are too stressed: Stress causes havoc on our body and affects the normal functioning of hormones. At times, though stress is unavoidable one must find ways to relax and de-stress. Make time for yourself to do things that can make you happy. Changing schedule: Even a simple change in your daily schedule could be the cause of your delayed period. If you recently changed your work timings from day to night, or if you had been travelling or if you have a major family function at your home, it could leave your body clock confused. Your periods will get back to normal when you come back to your regular schedule. You are exercising too much: In athletes, amenorrhea (absence of a period) is common due to intense training, heavy exercise and sudden change in weight. Even if you have suddenly started exercising, you tend to miss or have a delayed period. Exercise elevates metabolism and thus affects the menstrual cycle. Birth Control pills: Birth control pills also affect a woman's menstrual flow. Birth control pills are used by many women to regulate their periods. If you are taking birth control pills, check for its side effects. 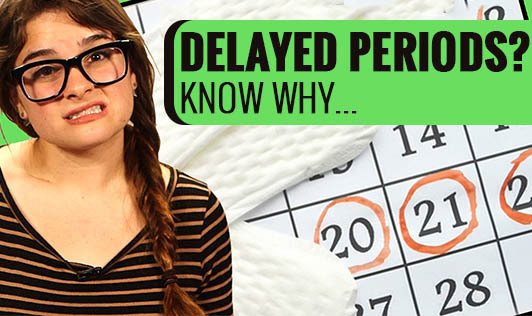 If you are not sure if birth control pills are the reason behind your delayed periods, then check with your doctor. You might be pregnant: If you are trying to get pregnant, delayed or a missed period could indicate a pregnancy. Do a home pregnancy test and take a test yourself. If you are unclear about the results, it is best to see an expert.